Four years into the third generation Hyundai Tucson, it’s now no longer the baby SUV in the line-up. It’s fresh-faced for 2019 with substantial revisions inside and out and a shake-up of the features and available engines. 164-horsepower 2.0-liter and 181-hp 2.4-liter engines now provide the power, with last year’s 1.6T dropped from the line-up altogether, while front-wheel drive remains standard with all-wheel drive optional. A six-speed automatic is still the only gearbox as the Tucson vies to become the last word in everyday SUV comfort against top rivals like the Mazda CX-5 and Honda CR-V. Priced from $23,200 to $32,950, there’s a good variety with six trims available and options like heated rear seats, wireless device charging, and smart cruise control now available. 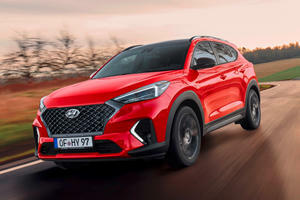 Revised for 2019, Hyundai’s hot-selling compact SUV looks to keep itself at the forefront of buyers’ minds with a fresh new face and a revised equipment line-up that includes more standard features than ever before, even on the base SE derivative. Slightly more expensive to get into, the base model now sets you back $23,200 as a front-wheel drive model, with all-wheel drive available for $1,400. The turbocharged engine, previously available on top trims has now been dropped, with the 2.4-liter motor introduced last year now becoming the range-topping motor available from the SEL trim upwards. This third-generation Tucson has impressed since day one and looks to continue in the same vein amidst tough competition from the Honda CR-V.
For the 2019 MY, the exterior of the Hyundai has been extensively revised. 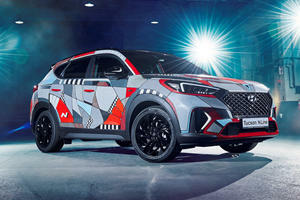 A new front fascia features an updated version of Hyundai’s hexagonal ‘Cascading Grille,’ framed on either side by newly designed projector headlights. LED accents are standard from the Value model onwards, while LED daytime running lights, LED headlights, and LED taillights become the standard for the Sport, Limited, and Ultimate trims, as do front fog lights. Beneath the grille, a character line runs the width of the front bumper and splits the fog lamp housing to break the tall facade. A segment-standard, black body cladding features on the lower portion of the front bumper flowing into the wheel arches and continuing along the lower side sills, though a metal look trim panel features on the lower edge of the sills. 17-inch wheels appear on the SE and Value models, 18-inch alloys on the SEL, Limited, and Ultimate trims, and 19-inch wheels on the Sport derivative, with all of the wheel designs revised for the new model year. Like before, an ascending accent line runs the length of the doors and tracing the line of the windows which feature standard black surrounds with chrome accents on higher trims. On the Limited and Ultimate trims, turn signals are incorporated into the side mirrors, while door handles go from body-colored to chromed items. These top two trims also get a panoramic sunroof. At the rear, new taillights have been incorporated into the rear tailgate design, with the rest of the design left largely unchanged. Black and silver trim still dominates the lower bumper design with chromed tailpipes positioned on the right-hand side of the bumper. The top of the tailgate is now different from before as a shark-fin antenna is standard across the line-up. The color palette for the exterior of the 2019 Tucson comprises nine colors; Dazzling White, White Pearl, Molten Silver, Coliseum Gray, Aqua Blue, Dusk Blue, Sage Brown, Gemstone Red, and Black Noir Pearl. The two entry trims for the 2019 Tucson, the SE and Value, get a base 2.0-liter four-banger developing 161 horsepower and 150 lb-ft of torque. It’s the same engine as found in the base Elantra GT, and its criticisms from there still stand - it’s a gutless motor that doesn’t deal well with the weight of a compact hatch to haul, let alone the ungainliness of an SUV like the Tucson. A step up to SEL trim sees a 2.4-liter four-cylinder slot under the hood for all subsequent models, with the 1.6T dropped from the line-up. The 2.4-liter, introduced for the Sport model in 2018, produces 181 hp and 175 lb-ft, making it more powerful but less torquey than the motor it now replaces. Despite the extra power, this isn’t really a hot performance motor and it feels strained when pushing hard. But it is responsive in traffic and offers a well-metered power delivery that makes it easy to use about town. Both engines are mated to a standard six-speed automatic gearbox that effortlessly shuffles through the gears rather comfortably if a little forgettable in its manner and the standard drivetrain for all models is front-wheel drive. All-wheel drive is available on both engines and at all trims for an extra $1,400. The 2.4 is definitely the better motor of the two, offering more usable performance about town and on the highway, but its larger displacement and lack of low range torque mean it’s the thirstier of the two engines as well. In front-wheel drive guise, the 2.4’s average economy estimate of 25 mpg with a mixture of city and highway driving means you’ll get around 410 miles of range on a 16.4-gallon fuel tank. 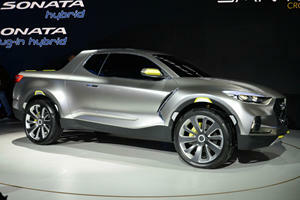 The 2.0-liter, meanwhile, has an estimate of 26 mpg, extending that range marginally to 426 miles per tank. City and highway values of 22 and 28 mpg respectively for the larger motor are also less than the 23 and 30 mpg from the 2.0-liter, but it’s an acceptable compromise for improved performance. The all-wheel drive models lose a little more of their economy with extra drain on resources, with estimates for the 2.0-liter at 22/25/23 mpg city/highway/combined while the 2.4’s estimates are 21/26/23 mpg, making it more or less equal to the base motor when equipped with all-wheel drive. The Tucson has a bias towards the cabin being a comfortable and refined place to be, compromising on cargo volume for the sake of interior comfort. Climbing up into the cabin is easy with wide door apertures and relatively generous proportions. Once inside, both the driver and front passenger seats offer a wide range of adjustment with a standard six-way adjustable seat on the base SE and power eight-way driver adjustment on all subsequent trims making it easy to find a good driving position. The cloth seats are firm and relatively flat, but offer decent levels of support and high levels of comfort on longer journeys. Likewise, the rear seats are comfortable and they too offer an abundance of head and legroom, providing far more than almost all rivals. Even tall adults will be more than comfortable in the back of the Tucson, while the full seating complement for five is applicable to rear-facing child seats as well. The only trouble with the rear is that the forward-facing C-pillars require taller rear passengers to duck a little on the way in and out which is a minor nuisance. The controls inside the Tucson are simply laid out and easy to use, and the 2019 redesign of the interior has been a minor one focusing mainly on the appearance of the dash rather than rearranging the ergonomics which are, as is typical of Hyundai’s recent products, excellent. For 2019, all models get a seven-inch touchscreen as standard infotainment with Bluetooth connectivity, a single USB port, and built-in Apple CarPlay and Android Auto functionality. Single zone manual air conditioning is standard on the base SE, as is a rearview camera, and six speakers, but as you climb the trim ladder you’ll get satellite radio, dual-zone climate, an eight speaker Infinity sound system, dual USB ports, wireless charging pad, and an eight-inch touch screen with navigation. Build quality within the cabin is decent, but on the SE and SEL trims some of the materials feel a little ‘budget’ with fair amounts of hard plastics. Higher trims improve the offering with more soft touch materials and padding on all the major surfaces such as the armrests and doors. Everything feels solid, but the Tucson doesn’t feel as if its built to the same premium finish as the Honda HR-V does. Hyundai willingly made the sacrifice of losing cargo volume in favor of gaining masses of interior space for rear passengers. That’s not to say the cargo bay is small. At 31 cubic feet with the back seats in place there’s still usable space for family holidays and for regular school runs and grocery trips. But it’s some way off the class-leaders, particularly Honda with the CR-V that provides 39.2 cubic feet of cargo volume. The rear seats in the Tucson do fold in a 60/40 split, increasing cargo volume to a maximum 61.9 cubic feet, but the CR-V offers 75.8, placing the Tucson firmly in ‘acceptable but average’ territory for its segment. The Hyundai Tucson is rather unremarkable to drive. To clarify, it’s not bad, not by any means, but it’s just unmemorable by most measures which may be exactly what endears it to some buyers who don’t want anything that lingers in the memory for too long. The base engine is best avoided if you can afford a higher specification level, as it’s gutless and loathes being worked. The 2.4 is decent, with peppy low-down responses and it works well with the six-speed automatic to slur through gears in comfort while still providing decent performance and economy. The Tucson handles well too, with suspension that balances comfort with support on changing surfaces quite well. It always maintains composure, is never unsettled, and filters out small bumps to perfection while minimizing the effects of larger bumps. Body roll is kept in check too, but it’s by no means a sporty SUV, especially when the Mazda CX-5 begs to be driven like a hot hatch. The steering is responsive and turn in is sharp and direct, but because it’s an electrically power-assisted setup it has zero feedback, even if they did get the weighting pretty spot on. That’s about par for the course though as not many rivals offer steering setups dripping with feedback. There’s nothing the Tucson does wrong, and in any circumstance on just about any surface you’ll be pleased with the levels of comfort and refinement, and with next to no noise intrusion you’ll feel mighty relaxed when you climb out at the end of your journey. But there’s just no character to the Tucson. He’s a nice guy, and mom and dad would approve, but he’d make a very boring husband, and it’s that sort of attitude that makes the Tucson an appliance and nothing more. The Tucson is solidly screwed together, as are most modern Hyundais, and even the bits of scratchy plastic don’t feel badly put together. There aren’t really any problems with the Tucson. 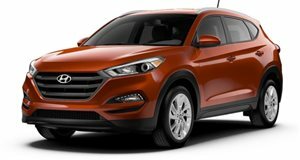 The engines are tried and trusted in various applications, and of course Hyundai provides an extensive 10-year/100,000-mile drivetrain warranty that ensures the Hyundai Tucson will still keep trekking on long after its paid off. A general 5-year/60,000-mile limited warranty also applies. There has only been one recall for the current generation Tucson, where pre-facelift models had electrical issues pertaining to trailer brake lights that remaining constantly illuminated. Other than that, the Tucson is robust and reliable. There are six trims available for the 2019 Tucson, each more extensively kitted out than they were last year and offering great value for money compared to rivals who charge a lot for not so much. The trims are SE, Value, SEL, Sport, Limited, and Premium. The base Tucson SE is priced from $23,200 and features a 2.0-liter motor, six-speed automatic gearbox, 17-inch alloys, automatic headlights, heated mirrors, a rearview camera, height adjustable driver’s seat, a six speaker sound system, and a seven-inch touchscreen featuring Bluetooth and USB inputs as well as Apple CarPlay and Android Auto functionality in addition to the AM/FM/MP3 abilities. For 2019, there’s bolstered safety as well, with the SE featuring forward collision warning, automatic emergency braking, and lane keeping assist as standard. A step up to Value retains the 2.0-liter motor, but adds roof rails, power adjustment for the driver’s seat, heated front seats, keyless access and push-button start, SiriusXM satellite radio, and Blue Link communication services, along with added safety in the form of blind spot monitoring with rear cross-traffic alert. The Value model is modestly priced at just $24,650 in front-wheel drive form. The Tucson SEL is similarly equipped to the Value, but upgrades to the 181-hp 2.4-liter engine, equips 18-inch alloy wheels, upgraded exterior trimmings, and gets dual-zone climate control and a second row USB port for a price of $25,600. For the engine upgrade alone, and the still impressive standard safety features for the money, the SEL gets our choice as the pick of the lot. A Tucson Sport will cost you $27,700 and equips the Tucson with a range of exterior upgrades such as 19-inch alloy wheels, LED head- and taillights, Sport-specific exterior trim elements, foglights, and a hands-free liftgate. An auto-dimming rearview mirror and wireless smartphone charging with compatible devices are also included. The Limited trim equips the same features to the Tucson, but adds leather upholstery, upgraded door trimmings, a heated steering wheel, 360-degree parking camera and a power adjustable passenger seat to the Tucson package. The Limited trim starts getting pricey with a base MSRP of $28,900. The range-topping Ultimate trim starts off at $31,550, but includes features such as a panoramic sunroof, automatic high beams, an upgraded forward collision mitigation system, adaptive cruise control, a color TFT driver display screen, ventilated front seats, heated rear seats, and an upgraded eight-inch touchscreen infotainment system with built-in navigation. All trim prices mentioned above are front-wheel drive models, but are available with all-wheel drive for an additional $1,400. The Hyundai Tucson’s 2019 upgrade has given it a stylish new face and increased safety and specification across the range without compromising on the comfort, affordability, and practicality we’ve always liked about it. It’s not the most exciting to drive, but it is supremely comfortable, and taller passengers will appreciate the copious amounts of space in the rear of the cabin. If you’re after a driver’s SUV, the Mazda CX-5 should get your hard-earned cash, and if it’s cargo space and top quality materials you’re after, then look at a Honda CR-V, but if comfort, reliability, and getting from A to B with all the necessary features at a decent price is high on your priority list, a Tucson SEL is one of the best possible ways to get around. As an established player in this segment, the Tucson continues to prove Hyundai is right up there with the best of the established brands.